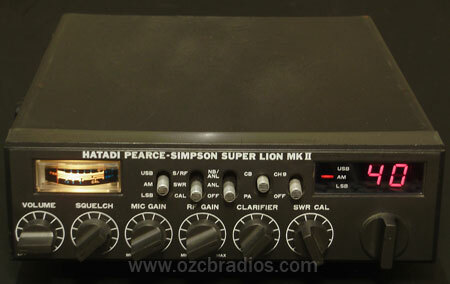 My very first radio was a Pearce Simpson Super Lion MK II27MHz CB Radio. The radio was second hand with 5 watts on AM and 12.5 watts on SSB. I had the radio setup in my bedroom with a car ¼ wave antenna mounted with a car gutter mount base on the side of the roof outside my window. During summer when the skip was in I would often get as far north as Mackay and Cairns North Queensland (about 2500 and 2900 kms), with the odd trip to Fitzroy crossing in Western Australia (about 3400 kms) and once to a station on the north island of New Zealand (about 3300 kms). When I made the move to Western Australia in 2005, I had most of my radio gear in storage. However, during a storm most of the equipment was ruined by water damage, so the radio was thrown out. A few years ago while looking for some gear on eBay, I found another Pearce Simpson Super Lion MK II which I bought straight away for old times sake. I have used it with the same results as i had all those years ago with many contacts made, mostly in Queensland. My entry into UHF CB and also power games was when I lived in Ballarat Victoria. At the time I had a Uniden UH077 UFH CB radio which had been tweaked up to a massive 7.5 watts. As I was boarding with a family, I had to use a mobile antenna which was mounted direct to the top of the case with the coax soldered direct to the PCB inside the case. At one stage a mate bolted the finals from a Phillips FM 828 to the back of the UH077 which gave me about 25 watts. After a few months he came to me with an offer to trade in the UH077 on an Phillips FM 900. The radio was from a auction from the RTA (now Vic Roads) when they upgraded the comms gear across the state. The radio was realigned, the EPPROM re-flashed with new channels for UHF CB and away I went. The difference the extra power made was amazing! 50 watts into my AE409 9 dB mobile antenna, which I mounted onto the gutter of my 1974 Kingswood (The Rocket), meant I could talk to people in Bendigo, Eastern suburbs of Melbourne from Ballarat. At one time at a friends house in Bena (near Korumburra Victoria) I could talk to people in Northern Tasmania simplex. After a few years and a steady decline in interest in CB radio, I packed up the FM 900 and it has stayed in storage since. 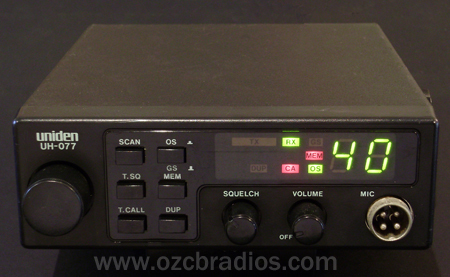 The next CB radio I purchased was an Icom IC400 pro and installed into my VX Holden acclaim wagon and then my VY II Adventra wagon until I made the move to amateur radio after I got my Standard licence. I replaced the IC 400 pro with an IC 208h 2m-70cm dual bander. I still have the IC 400 pro and it is in use in the CBRS repeater as the receiver.